Festival marking its 15th anniversary with five star-packed concerts over three days. The SweetWater Music Festival (September 21 to 23 in Meaford and Owen Sound, Ontario) has an extra-special festival this weekend to celebrate its 15th anniversary. Audiences will once again enjoy unique, cutting-edge concerts featuring classical, jazz and contemporary music. Artistic Director Mark Fewer has brought together a stellar line-up including many past SweetWater favs including James Campbell, Denise Djokic, Joe Phillips, Aiyun Huang, Matthias Maute, Douglas McNabney, Dean McNeill, Graham Campbell, Kati Gleiser, and Guy Few. Performing at SweetWater for the first time are soprano Suzie LeBlanc, pianist Alexander Tselyakov, and harpsichordist Jason J. Moy. SweetWater 2018 will also include young talents on the music scene like Quatuor Despax, Yolanda Bruno, and Kaelin Murphy. The Opening Night Gala at the Historic Leith Church, After Hours Again Late Night Jazz on Saturday night, and Festival Passes are sold out. There are some tickets remaining for concerts at the Roxy Theatre in Owen Sound on Saturday and Sunday. Brave New World II, the Saturday Matinee at 4 p.m., features Aiyun Huang and Denise Djokic. Huang will perform Hitchcock Etudes, a multimedia work featuring clips from Hitchcock classics. Wait…What?, the Saturday Early Evening concert at 7 pm., features an all-star line-up performing works by Vivaldi to Walton to Carli to Bach and beyond. 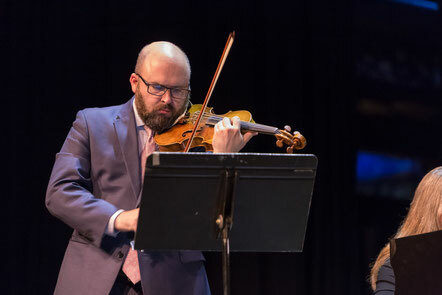 SweetWater 2018 concludes with a spectacular Sunday Matinee Finale, Out With a Bang, at 2 p.m. SweetWater headliners perform works by Polenc, Khactacturian, and Brahms. Tickets for all three concerts are available online and at the Roxy Theatre Box Office (in person or call 519 371 2833). SweetWater also offers up free, interactive music events at Owen Sound’s Harmony Centre Saturday AM beginning with the kid-friendly Mozart for Munchkins featuring Kati Gleiser. Other events include the string instrument showcase, Luthier Exhibit, and the community playalong Classical Jam. It concludes with the Luthier Performance. Denise Djokic and Quatuor Despax perform Shubert’s C Major Cell Quintet. SweetWater is supported by Canadian Heritage, Ontario Arts Council, Community Foundation Grey Bruce the Eva Leflar Foundation, The Medley Family, Murray & Ruth Cathcart, Classical FM 102.9, Tamming Law, and Bruce & Mary Hutchinson.